Not just for pasta, these shallow pottery bowls are the perfect place for your favorite soup, salad, grains, veggies.... or whatever! This set of Buddha bowls, also called grain bowls, hippie bowls, macro bowls, and power bowls are the best way to serve your one-dish meals. Stoneware's natural insulation helps keep hot food hot and cold food cold. These pasta/Buddha bowls are approx 9 in diameter x 2 in. Fired to cone 5/6, Stoneware is microwave and dishwasher safe. 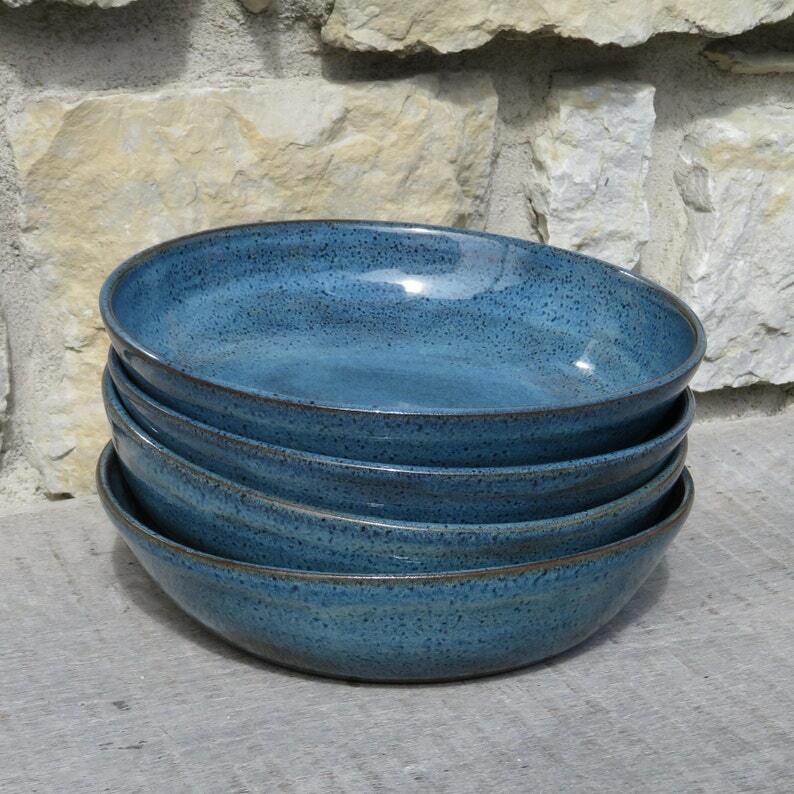 These handcrafted pottery pasta bowls are glazed with you choice of glaze color. Each piece is individually wheel thrown and hand painted. Natural variations will occur in both shape and color of pottery bowls. Coordinating pieces available in separate listings. This is a stock photo. I throw each item individually. Pieces will be similar in size and shape, but natural variations will occur in size, shape and glazing. That's what makes handmade so great!! Love them! Perfect for salad or pasta. They came in all different colors just like I asked. Thank-you! Beautiful bowls! I'm so pleased with these. Thanks so much!! I ordered these pasta bowls and dinner and lunch plates. They arrived on time and packed beautifully and very well. I ordered 5 different colors in plates and like them all very much except the tourmaline. my favorite was Rutile blue and the smokey purple. This is a great shop owner and will order from her again to make my whole collection of pottery!